In her seventeenth year, Princess Alera of Hytanica faces one duty: to marry the man who will be king. But her father's choice of suitor fills her with despair.When the palace guard captures and intruder—a boy her age with steel-blue eyes, hailing from her kingdom's greatest enemy—Alera is alarmed…and intrigued. But she could not have guessed that their clandestine meetings would unveil the dark legacy shadowing both their lands. In this mystical world of court conspiracies and blood magic, loyalties will be tested. Courage won't be enough. And as the battle begins for everything Alera holds dear, love may be the downfall of a kingdom. 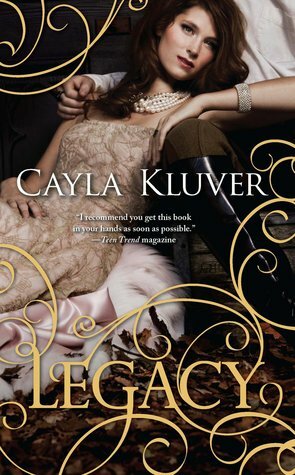 Legacy is a highly imaginative book. It's hard to place it in a genre because though it is set in a fantasy world, it is written mostly like a historical fiction. The oddness of the genre kind of threw me off in the beginning, and that being said, it took me a long time to get into the story. There was a lot of elegant descriptions and moments where the main characters thought about events that occurred. These scenes may or may not be necessary to understand the plot of the book, but they were definitely kind of dry. My mind couldn't help but wander for the first half of the story as I thought of Twitter and Facebook and other distractions. Alera was definitely an interesting, thought confusing character. She calmly accepts that it is her fate to be a pawn of her husband and her kingdom, yet she resists the attempts of Lord Steldor to woo her. She seemed to knuckle under to her father and the way that Hytanica was ruled by the men, but at the same time she resisted Steldor like he was the plague...It seemed like she was contradicting her character by disobeying him, but at the same time you wanted her to have SOME struggle or fight in her or she would have been a useless character...On that note, I hate to say it but I found Alera kind of dry and boring. She describes the palace and intricate details of her life as a princess exceedingly well, but she doesn't have that spark about her that a main character needs to really stick in your mind. She isn't particularly witty, or funny, or anything really...she just...is...You want to side with her in her disagreements with Steldor but other than that there really isn't much personality to latch onto. You have a much better chance of getting to know Steldor's arrogance or the puzzle that exists in Kyenn/Narian. Narian was by far my favorite character in the bunch. Both he and Steldor are quite fascinating in their own right, but they are definitely contrasting characters. Where Steldor is cold, assuming and arrogant, Narian presents a question that you spend the entire book trying to answer.He's polite, courteous, and brave...yet he's dark and secretive so you don't know if he is using his wiles to trick the Princess or because he really likes her. He saves her life, yet threatens her...You never really know what his game is...even when the book ends. Also, where Narian becomes more and more mysterious, Steldor somehow manages to become increasingly endearing and annoying at the same time. You WANT to like him because hes good for the kingdom, and apparently loves Alera...but he's SO rude and condescending...I can't even begin to root for him because for each step he takes forward, he takes two or three back. I give Legacy 3.5 Keys. It is a very good book. It's well written and thought out extremely well, but it does lack some core emotional elements with regards to the characters. What makes readers (me specifically) come back for more isn't just a cool plot or a fantastic magical realm...it's the fact that I need to care about the people whose lives I'm reading about. When I don't really give a crap if the characters live, die, or run away to join the circus, I tend not to want to continue a series. However...this series is one exception to the rule. I am definitely going to try the next book Allegiance, not only because I want to know what happens, but because the last half of the book was so full of intrigue and plotting that I can only hope that the next book will be full of the same. The cover is kind of confusing too. Middle age/fantasy/Christian? I didn't get anything like that from the cover. Although it is very pretty.